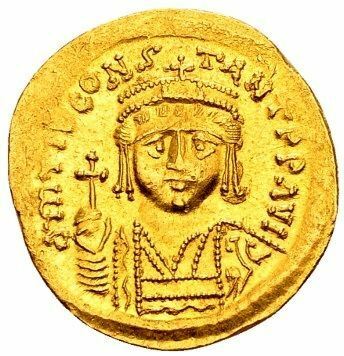 Flavius Tiberius Constantinus Augustus was Byzantine emperor from 574 to 582. He was close friends with his predecessor Justin II, and was eventually adopted by him as his son and heir. On 26 September 578, Tiberius was made Augustus by the rapidly-failing Justin. He used that opportunity to give away 7,200 pounds of gold, a practice that he continued annually throughout the four years of his reign. Sophia, Justin's widow, tried to maintain her power and influence by marrying the new emperor, but he refused her proposal because he was already married to Ino. His reign was marked by the ongoing migrations of the Avars and the Slavs, and by war with the Sasanian Empire in the East. By 582, he was dying - probably of food poisoning - and named two heirs; Maurice and Germanus, his sons-in-law. He apparently planned to divide the empire. The plan was never implemented, an on August 13 582 he elevated Maurice to Augustus, then died the following day.